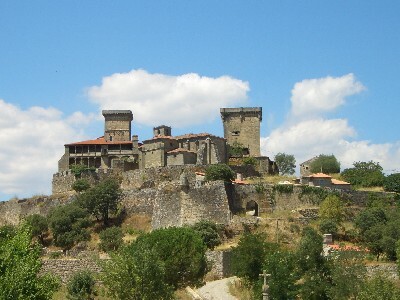 The castle at Monterrei is situated in the very south east corner of Galicia, a mere 10 minutes from Portugal on a hill that overlooks the town of Verin in Ourense. We decided to visit it because of its reputation as a spectacular castle in dramatic surroundings with many myths and stories associated with it. 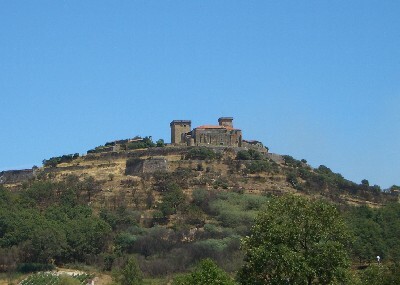 Monterrei castle is reached on either the N-525 or A-52 roads from Ourense. Our journey took almost four hours from a starting point 40 km south of Santiago de Compostela and even travelling from Ourense the journey is over an hour. I mention this because, as with every other tourist attraction in Galicia, the castle closes completely between the hours of 2.00pm and 5.00pm. In effect this almost guarantees that your arrival will coincide beautifully with the closing of the castle and that, unless you wish to twiddle your thumbs for three hours and return to your base destination at 2.00am in the morning, visiting this castle is simply unpractical. 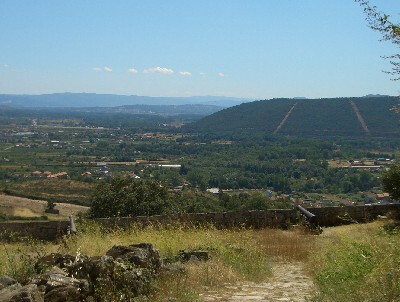 As you approach Monterrei the castle appears ominously on the horizon and it is certainly imposing. A parador on an adjacent peak is also clearly visible, but it is the castle that captures your immediate attention and from the outside at least, lives up to expectations. From a distance two towers are visible and as you grow closer you start to notice the massive walls that rap and spiral down the hill below the main structure. Parking is available at the bottom of the castle’s hill and although the climb looked daunting it took no more than a few minutes. The castle certainly increases in visual appeal as you draw closer and the various elements of its structure become more visible and detailed. 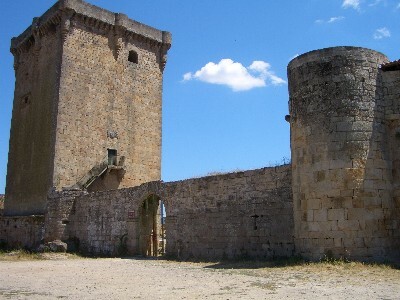 As you near the summit you enter the main castle walls through a heraldic arch from which point you can choose to venture left or right – both routes ultimately converge. At this point there is still a bit of climbing to go and the buildings that you see appear to be more recent and less battle worthy than the actual castle that sits a few metres above. As you gain in elevation the castle, and perhaps more so the massive walls around and below it, become even more imposing. There are also the crumbling remains of three old cannons still pointing out through the ramparts towards invisible assailants or ghosts from the past. With no other visitors around we found it quite eerie. When you finally reach the summit, and the main castle itself, the spectacle is slightly disappointing. In reality this is probably because hill top castles always look more spectacular from afar and the scale and massiveness of their construction is lost once you can no longer see the monument as a whole. We did of course have the disappointment of not being able to enter the building itself (it was the un-tourist friendly time of 2.15pm in the afternoon) and there was not a soul in sight. The structure was none the less worth seeing and the huge tower really did play its role in making us feel small and insignificant. 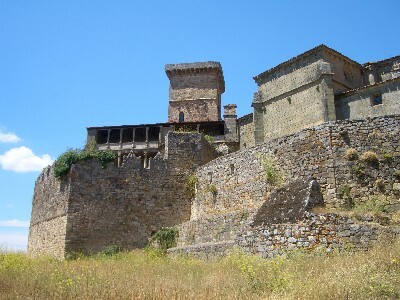 If you are based in Ourense, or prepared to make an early start from Vigo or Pontevedra and travel on the A52 or N120 (both good routes) this castle is worth a look. But do ensure you can reach it before the afternoon fiesta or your journey will be partially in vain. You can also add a visit to the town of Verin that sits at the foot of the castles small mountain.